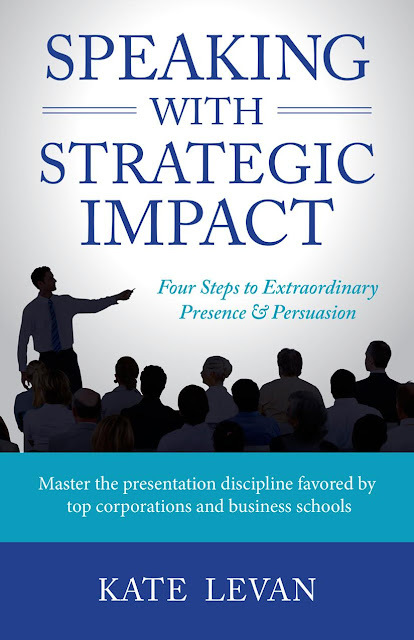 This morning, we have the pleasure of hosting a guest post from author Kate LeVan as part of the book tour for her latest book:Speaking with Strategic Impact. . Read her thoughts on a smart move for a smart woman, check out her new book and enter to win a prize in the book tour giveaway at the end of this post! Sometimes, it seems politically incorrect to do what is best for an audience. In these cases, you still must consider your relationship with the audience as primary and see these situations as opportunities to gently introduce colleagues to a better way. Here’s one example. My client prepared a short presentation for a conference, after which she was told she would participate in a panel discussion with four other presenters who had done the same. No other guidance was provided until right before the event, when I got a frantic call. She had learned that the organizer and other presenters—who clearly hadn’t yet prepared their respective remarks—decided that they would huddle on a couch up on the huge stage and casually banter about industry trends while the audience looked on. My client was disheartened because she had spent time preparing a researched point of view and motivational message for the association membership and saw this as an opportunity to position her company as an industry leader. She figured that all her time had been wasted and that she had no other option than to play by the new rules. As I saw it, the situation had all the marks of a group of people who were a) avoiding their responsibilities as guest speakers; and b) trying to make themselves feel safer by resorting to the lowest common denominator—sitting up there and winging it for ninety minutes. My other observation was that the organizer/moderator probably didn’t know how to structure the interaction in a way that would provide the audience with any real value. This presented an opportunity for my client: there was a void, and she already had what was needed to fill it. My client expressed concerned that she would appear overly confident and show-up the other presenters. I told her that this might be an unintended consequence, but that she needed to get clear about her real audience—the membership. Besides, her thematic approach, heartfelt words and professional delivery would make the moderator realize that inviting her was the smartest decision he ever made. even the other presenters—kept referring to it and her insights as they built on her point of view. The program was a success for everyone—but especially for my client who had stepped up to add real value. So, connect with your audience first in a way they expect. Earn the right to (subtly) ask them to tolerate something a bit different in the interest of giving them the most satisfying and productive outcome possible. If you do it for the audience and not to grandstand, you can’t go wrong. Thank you for hosting me! I hope your readers find the article valuable.